In the middle of the night — or the middle of the day when you’re playing hooky — the last thing you want is for your iPhone to bother you with a phone call. Apple had such potential disturbances in mind when it devised the Do Not Disturb feature. 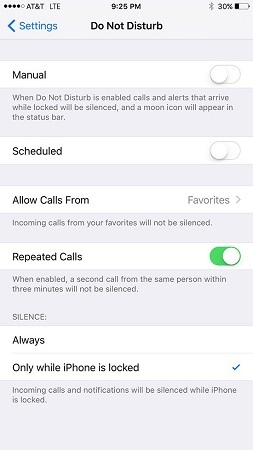 When you turn on the feature in Settings or in Control Center, your incoming calls and alerts will be silenced. A moon icon rises to the top of the status bar to remind you when Do Not Disturb is enabled. Right. Here’s how to address those situations when Do Not Disturb is enabled. From the Home screen, tap Settings → Do Not Disturb. Tap the Allow Calls From option and choose whether to allow calls from your Favorites, Everyone (kind of defeats the purpose of Do Not Disturb, eh? ), No One, All Contacts, or a particular Group Name from Contacts. Now calls from your favorites can get through. You can also permit calls from individual contacts. Tap to open the contact listing for the person and then tap Edit. Tap Ringtone (of which we’ll have more to say pronto) or Text Tone, and then tap the Emergency Bypass switch so that it is enabled (green is showing). Now you’ll hear sounds and detect vibrations from the person even when Do Not Disturb is on. You can also take advantage of the Repeated Calls option. When Repeated Calls is turned on, a second call from the same person within three minutes will not be silenced. The rationale is if somebody is trying to reach you that badly, the call must be important. You can also schedule when Do Not Disturb is on. Tap Settings → Do Not Disturb → Scheduled, and flip the switch on. Then tap the From To time field and choose a quiet time. From the Do Not Disturb settings, you can also silence the iPhone when you receive incoming calls and notifications, or choose to do so only when the phone is locked.